This morning I spent quite some time getting ready. I couldn’t decide what to wear. I’ve had my eye on my white bermuda shorts for a while, but am always hesitant to wear them. 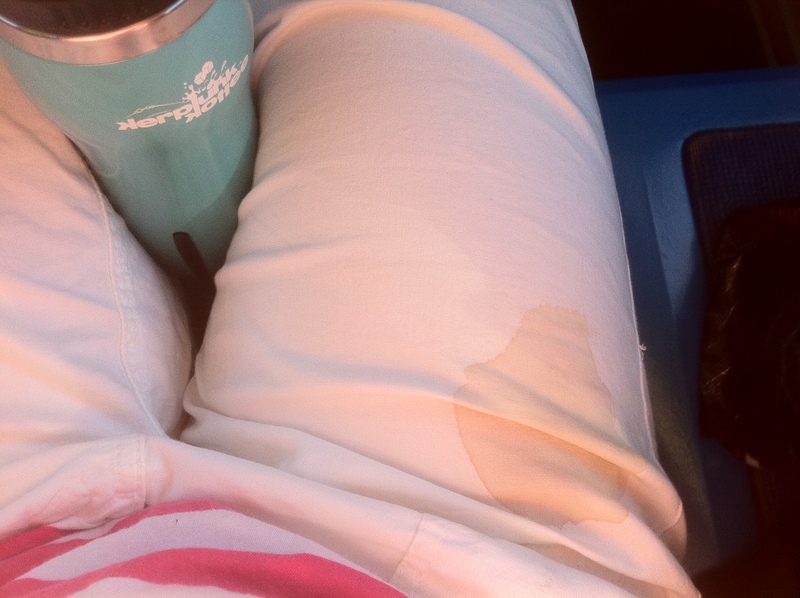 Why I even own white shorts, I don’t quite understand… I wouldn’t say I am a klutz, but I’m definitely in that family. Spilled tea. Classic. And yes, I walked around all day like that. Let’s get to some friday links. How the Fitnessista finds her workout motivation. This week was the perfect time for me to read this post. I dunno about you, but I haven’t been moving very much in this heat. Alexa at Simple Eats shared some of her favourite foodie books. It’s no secret that I love food (and I’m guessing you do too), but I also love to read; I’ll definitely be checking out some of these books. I read this on FitPerez a couple of weeks ago, and haven’t been able to shake it from my mind. S’mores are one of my favourite summery snacks. I also have a soft spot for cute things. These s’mores give me love face. Also I think this is a much easier way to enjoy s’mores when you aren’t near a campfire. My former roommates and I did not used to roast marshmallows by candlelight…..definitely not. Exercise has been linked to brain health. Care to share the best posts/articles/recipes you’ve seen this week? Have a good weekend my gorgeous friends. Be back monday! Actually, on FitPerez I read about taller women being at a greater risk for cancer. Great, I’m 5’10″… Haven’t been able to get that one off my mind!! hahaha, aww…your poor pantaloons. I am so the same. I am also in the klutz family and if I am wearing anything white tend to spill something on it immediately. Um…. how cute is your blog??? And how awesome is your layout? I think I’m the only person on wordpress who can’t find a decent layout. Can’t wait to read more about you! Looveee s’mores. If you go to the “How Sweet It Is” blog, she also posted an awesome s’more recipe just a few days ago! Nice read, I just passed this onto a colleague who was doing some research on that. And he actually bought me lunch since I found it for him smile So let me rephrase that: Thank you for lunch! “They may forget what you said, but they will never forget how you made them feel.” by Carl W. Buechner.